When my gorgeous friend Megan asked me to make her a couple of bespoke skirts, I was excited. I love bespoke, for sure. But what I love even more than bespoke, is bespoke for love. So one night some months ago, Megan came over for a glass of wine, a bowl of veggie soup, and a skirt brainstorm. We picked out some pretty spesh fabrics, one tablecloth that I'd been saving up for a special someone, and decided on a style. The blue-ish florally one is actually kind of the prototype for the Ruth, but without the pockets. The skirts turned out well, Megan expressed her happiness and gratitude, and then flew off the the 'States to visit her totally lovely, bearded boyfriend (now fiancee!) Ben who, I believe, took these photos. THEN I got a package in the mail, containing THESE! They are knitted apple cozies, and they fill my heart with joy! She even sent them, through the mail, WITH APPLES INSIDE THEM. Yes, the woman is out of control in her awesomeness. Now, these cozies are not to keep your apples warm, as in the case of tea, though I guess they could work for that too, should you be inclined towards warm apples. No, they are made to keep your apples safe when you take them in your handbag/backpack/purse. There are no words to explain the cuteness of these things. So cute, in fact, that the pair Megan sent me are pretty much on permanent display in our kitchen. So here's to Megan, her newly-acquired knitting skills and her appreciation for handmadeness. Yay! One Latin name I do really love though, and one which I possibly do over-use, is the name Eudyptula Minor, AKA Little Penguins. Now, as if little penguins weren't already the CUTEST thing ever, they also have a cool name. This, to me = awesomeness. Seeing them waddle across the beach on Phillip Island, and then again on Kangaroo Island were pretty much the ultra-cute highlights of my life. I first learnt the name when Olive picked out the book Little Penguin: The Life of Eudyptula Minor by Josie Watt and Matt Ottley at the local library. So so great. When my beautiful friend Claire sent me a Eudyptula Minor tea-towel all the way from Melbourne, I was a bit beside myself. I did hold off using it though, and I'm glad I did because Ally, (of the wren wedding dress and super-inspiring permaculture property fame) was destined to be the wearer of a chocolate-brown Eudyptula Minor P&E A-line with a little baby vintage button pleat detail! she wanted to be able to wear it to work, so needed it to be a little bit low-key. The pleat and buttons I added for balance and interest, as well as lifting the blues and greens of the print. I was SO happy with how it turned out! 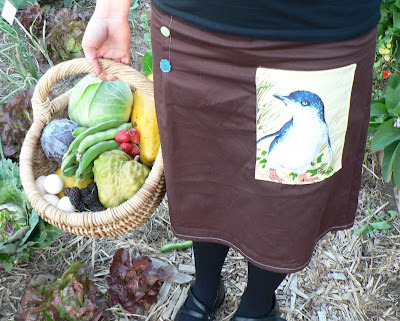 And I just have to say, I also love how Ally takes photos with produce from her garden. I'm pretty sure she's at least as cute as a little penguin. I was pretty excited when I got a request for a green-theme custom skirt. Green? I love green! 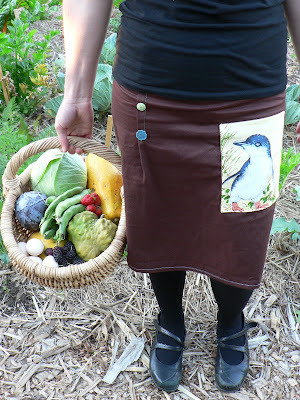 I'm a hippie, I live in a tree-house, I work in the bush, I collect flora and fauna fabric... I should have tons of green fabric right? WRONG! Last night I went to make a greeny skirt, and my cupboard was bare! Well, almost. I managed to piece together this beautiful vintage barkcloth situation, which, while not exactly green, has plenty of green ON it. And if you wore it with a green top, or green tights, or green shoes (how cool!) it'd probably look even greener. I'm getting pretty excited about the warming weather, thinking about frocks especially. I generally don't make a lot of dresses to sell, other than custom jobs, as I find the sizing of a good dress to be quite tricky and personal so prefer to make them only when I have an actual, real-life body to try them on. Also, because of the nature of found and reclaimed fabric, it's unusual that I get a piece big enough to make a dress, other than sheets, which do make lovely dresses. But I'm thinking I might re-think my strategy this summer, owing to the purchase of this delightful 70s pattern. It's a wrap dress, so I think it'd work for lots of shapes and sizes.